Known around the neighborhood (and by her little brother, Linus) for being crabby and bossy, Lucy can often be found dispensing advice from her 5-cent psychiatrist’s booth, yanking away Linus’ security blanket, or humiliating Charlie Brown. Lucy’s only weakness? Her unrequited love for the piano-playing Schroeder. Did you know: Lucy often speaks out for women’s rights and has high aspirations to one day be President and Queen. First appearance: March 3rd, 1986 Charlie Brown stands on the pitcher's mound. He says, "Okay, team . . We lost, but let's be good sports about it . . ." Charlie Brown says, "Let's give our opponets a good old-fashioned 'hip, hip, hurray!'" A mad Lucy kicks her baseball glove and yells, "I hate losing!" Lucy stands in the outfield and shouts, "I'll 'hip, hip, ' but I won't 'hurray!'" First appearance: July 2nd, 1956 Charlie Brown stands afar in the field watching Lucy talking to Linus. She looks at a tree and says, "This, Linus, is a Giant Oak!" Charlie Brown exclaims,"Oak?!" Linus and Lucy walk off annd she continues, "When oak trees get real old, they're cut down and used to make knotty-pine recreation rooms" Charlie Brown looks at the reader and says, "Knotty-Pine?!" He shudders and shou Latest appearance: February 4th, 2007 / First appearance: January 31st, 1960 Snoopy slides on the ice. Snoopy smiles as he slides on his belly across the ice. Lucy holds up her hand and says to Snoopy, "Hold it!!" Lucy says, "Is this all you have to do? Are you going to spend the whole day sliding back and forth on a piece of ice?" Lucy says, "Do you think these days were given to you to waste? Doesn't life mean more to you than this?!" S First appearance: July 22nd, 1991 Lucy and Linus build this huge sandcastle. Lucy says, " . . And a thousand years from now people will look at what we have built here today, and be totally amazed . . ." Linus looks at a storm cloud on the horizon. First appearance: December 26th, 1977 Charlie Brown and Lucy stand at the wall. Lucy says, "Just before the test began, our teacher goes, 'Does everyone have a pencil?'" Lucy continues, "This fat kid across the aisle from me goes, 'I don't!'" Lucy says, "Then this other kid with the glasses goes, 'Sure you do . . . You have mine!'" Charlie Brown asks, "Whatever happened to the word 'Said'?" 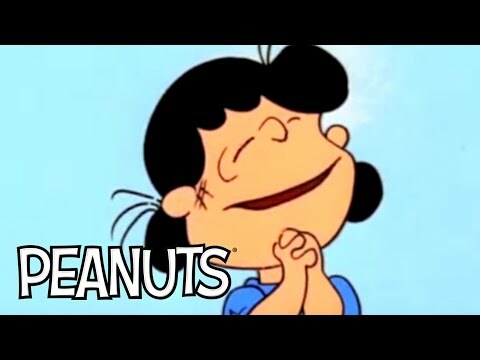 Latest appearance: July 14th, 2007 / First appearance: July 16th, 1960 Lucy kneels on the floor in an empty room doddling and looks up at Charlie Brown who is looking down at her. She says, "I'm going to make a good political cartoonist, Charlie Brown." Charlie Brown stoops down in front of Lucy. Lucy bends over her paper and exclaims, "I'm lashing out with my crayon!" Lucy grimaces as her crayon snaps. Charlie Brown looks at her and asks, "Who are First appearance: June 11th, 1958 Charlie Brown stares up in the sky to catch the ball as Lucy watches. Violet says to Patty, "If Charlie Brown catches this fly ball, we'll win the championship!" Violet continues, "Just think of it..we'll be Champions!" Patty replies, "We'll all get our names in the paper!" Violet says, "And they'll give us a gold cup!" Patty continues, "And pins, and buttons, and pennants.." Latest appearance: May 18th, 2000 / First appearance: May 23rd, 1974 Snoopy lies on the doghouse. Lucy says, "Well, I'm glad to see you're back." Snoopy thinks, "Thank you." Lucy continues, "But what a disaster! You disgraced the name of 'Beagle Scout'!" Lucy walks away and says, "Imagine! Getting lost, and then being rescued by a Girl Scout selling cookies!" Snoopy lies on the doghouse and thinks, "They were good cookies!" First appearance: April 10th, 1999 Rerun stands on Charlie's front step holding a piece of paper. rerun says, "How would you like to buy a picture I drew of your dog?" Charlie says, "Are you a salesman?" Rerun says, "A what?" Charlie says, "Salesman are a dying breed.." Lucy and Rerun watch TV. Lucy says, "Did you sell your drawing?" Rerun says, "I couldn't... I'm a dying breed..." Latest appearance: May 14th, 2007 / First appearance: May 16th, 1960 Lucy and Patty are sittingon a bench in the baseball field. Lucy says, " I can't look!" Patty replies, "The score is three to two in the last of the ninth! Lucy says, "But we have two outs!" Patty replies, "Buit Charlie Brown is on third! And our best hitter is coming up! Lucy asks, " Say, you don't think Charlie Brown will try to steal home, do you?" Patty replies, " Never! N First appearance: June 4th, 1980 Lucy sits in a beanbag. Linus holds a paper and says, "This new camp we're going to looks kind of interesting . . ." Linus continues, "They have guest speakers and discussion groups." Lucy says, "I don't know about those discussion groups." Lucy continues, "I like talking, but I hate listening!" First appearance: March 4th, 1998 As Charlie is about to pitch a baseball, Lucy says, "Hey, manager.." Charlie asks, "Now what?" Lucy says, "We had tortellini for dinner last night.." Lucy adds, "Some of it was white, some green, and some kind of orange.. Isn't that something?" Lucy then asks, "How's the game going?" Latest appearance: October 31st, 2010 / First appearance: October 27th, 1963 "Do you think this stationery is good enough?" Linus asks Lucy. "I'd hate to upset him by using cheap stationery..." Linus adds as they walk down the hall. 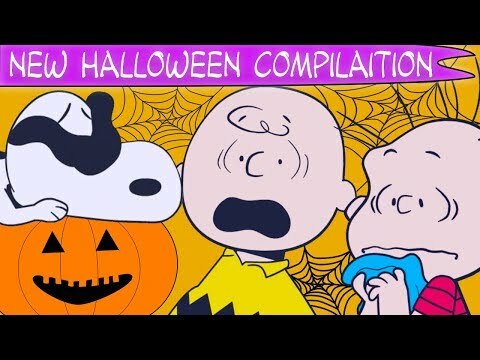 Linus sits at a table with Lucy and writes: "Dear Great Pumpkin, Oh, how I look forward to your arrival on Halloween night." "When you rise out of the pumpkin patch, and fly through the air, please bring me lots of prese First appearance: May 21st, 1979 Lucy walks from the outfield and says, "Hey, manager!" Charlie Brown stands on the pitchers mound. Lucy says, "Look, I got a new glove!" Lucy walks away and says, "It's bigger than my old one . . ." Lucy has her glove full and says, "It holds more potato chips!" First appearance: July 31st, 1957 Lucy approaches Charlie Brown standing outside the house. He says, "I think my trouble is that I feel guilty all the time..." Lucy looks away. He falls over as she yells, "NOT GUILTY!" He is dazed as she asks, "Now, how do you feel?" Latest appearance: July 5th, 2012 / First appearance: July 8th, 1965 Schroeder wears his catchers uniform and talks to Lucy and Charlie Brown. Schroeder says, "Perhaps you shouldn't be a playing manager, Charlie Brown, perhaps you should be a bench manager." Lucy says, "That's a good idea . . . You'd be a great bench manager, Charlie Brown . . ." Lucy says, "You could say, 'Bench do this! Bench do that!' You could even be in charge of where we pu First appearance: March 17th, 1972 Lucy swings the bat and hits the ball. Schroeder's hat lifts off his head. Charlie Brown shouts, "She did it! She hit a home run!" Schroeder frowns. Charlie Brown points at thim and says, "And you're going to have to stand out by home plate, and kiss her! You promised!!" Lucy runs around the bases and sings, "She's rounding first . . . She's rounding second . . She's roundi First appearance: November 12th, 1956 Lucy reads to Linus, who is sucking his thumb and holding his blanket. She reads, "'With the angry natives right at their heels, the boy and the girl ran to the boat, leaped in and rowed away!'" She continues, "'The long chase through a thousand miles of jungle was over..they were safe at last...The end' Wow, what a story!" They both sit thinking for a moment. Linus comme Latest appearance: January 25th, 2015 / First appearance: January 28th, 1968 Linus and Snoopy sit in the snow. Snoopy watches as Linus makes a snowball. Linus stands and packs the snowball. Linus throws his arm back, getting ready tot hrow it. Snoopy opens his mouth. PTUI! Snoopy spits the snowball out behind hum. Linus throws nothing. They don't look at one another. Linus bends over and examines his empty hand. Lucy sits on First appearance: April 17th, 1979 Lucy dances in the outfield and shouts, "We're number one!" Lucy continues to shout, "We're number one!" The ball bonks Lucy on the head. Lucy lies on the ground dazed and says, "I could have sworn we were number one . . ."
Lucy comes from that part of me that’s capable of saying mean and sarcastic things, which is not a good trait to have, so Lucy gives me a good outlet. But each character has a weakness and Lucy’s weakness is Schroeder. Lucy will put up with Beethoven all day if it means she’ll be closer to Schroeder. Lucy is always willing to dispense advice for a nickel.